So when Sherwin-Williams announced that their jewel-toned shade, “Oceanside”, was their color of the year, we knew we had found the starting point for our Coastal Cool Collaboration. 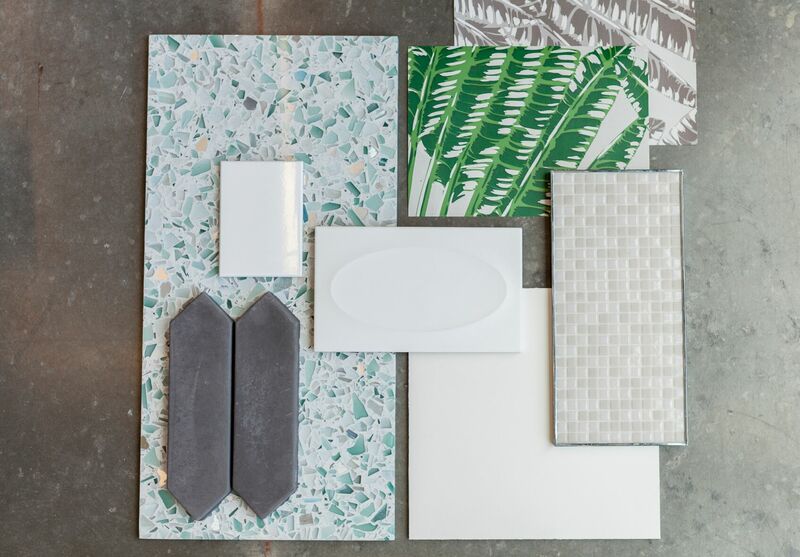 Our inspiration collaboration begins with match ups of our perennial favorite Vetrazzo colors, Bretagne Blue, Cubist Clear and Emerald Coast, paired with the bright and happy Oceanside Glass & Tile designs. The contrast of Oceanside’s geometric designs and Vetrazzo’s sea glass look make for a modern beach house that’s floating us on a wave of good vibes. 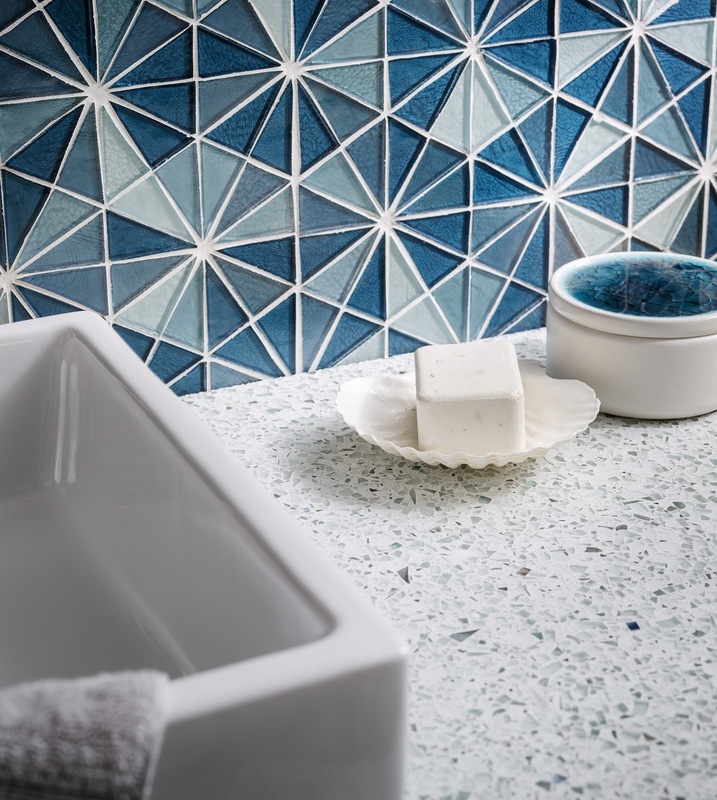 As seen above, the Oceanside Glass & Tile kaleidoscope Tessera backsplash brings in a playful element of modern geo designs and iridescent blue jewel tones. This shimmering, aqua colorscape brings out the cool blue tones in the tempered glass bits of the Cubist Clear countertop. There are as many reasons for a partnership between our companies as there are hues of blue in the sea, but really, it’s because we’ve been bumping into each other for years on projects where designers have specified our materials together. Oceanside’s backsplash tiles paired with our recycled glass countertops, or our slab on a shower bench with Oceanside’s mosaic shower walls. Every time it’s such a happy combo. As part of our program we’ve asked some of favorite designers to create designs that include tiles and countertops from Oceanside Glass & Tile and Vetrazzo along with the Sherwin-Williams shade that Architectural Digest calls, “a bridge between the familiar and the foreign.” As it’s namesake suggests, Oceanside includes a mix of blue, green and aqua that makes a bold statement without being garish. For the designers (and homeowners) who specify Vetrazzo in their spaces its the blue hues that remain top choices. Inspired by the ocean’s glittering blue-green hues and natural landscape, a Vetrazzo countertop captures the essence of the sea with hand inlaid pieces crafted from recycled glass — reminiscent of the kind you’d find on a walk down the shoreline. Designer, friend and Vetrazzo fan, Erin Moser, who pens the popular design blog, House of Turquoise would agree. 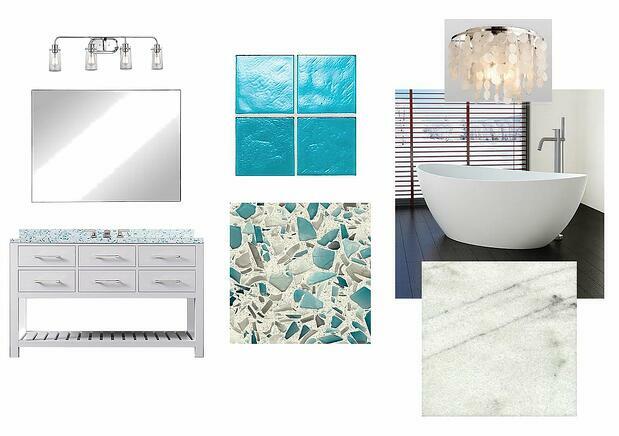 A passionate sea blue lover like us, Moser created this Oceanside-inspired moodboard featuring Vetrazzo’s Floating Blue for her personal bathroom she’s designing. So far she’s leaning toward Floating Blue made with recycled clear and turquoise architectural glass. A top choice in coastal designs it is available in our classic cement based collection and our new bio-resin based Designer Collection. The hardest part of this bathroom design for Moser has been choosing her favorite blue surface. “Both brands offer so many brilliant blue-green shades and they complement each other perfectly,” she said. “The way light reflects off the materials is absolutely beautiful too. You definitely don’t get that shimmer from other materials. The fact that both are handmade and of the highest quality make it a no-brainer. And I really love and respect how both companies are socially responsible." Here Moser paired Floating Blue and Oceanside Glass & Tile’s Aqua Non-Iridescent #125 and White Cherokee Georgia marble floor tile from Vetrazzo’s sister brand, Polycor. 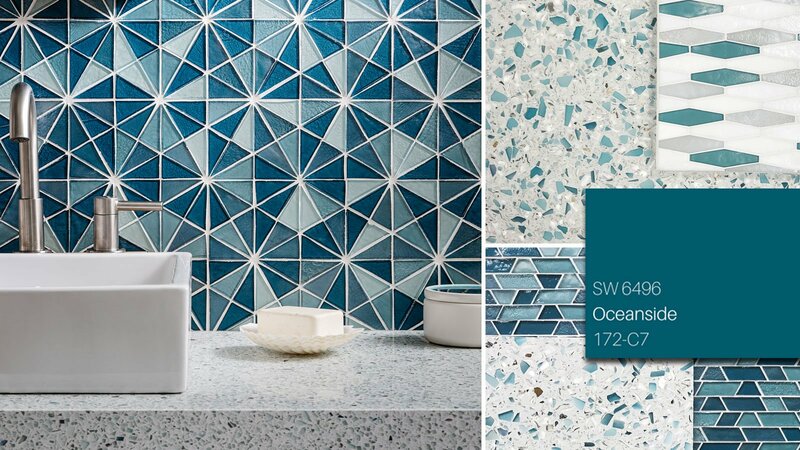 We didn’t specifically create any Vetrazzo color mixes for our Coastal Cool Collab, but when you see our Bretagne Blue recycled glass countertop in the same space as Oceanside Glass & Tile’s parallel pattern tiles, you could swear they were made for each other. The pairing of luminescent glass pieces and warm neutral oyster shell in the countertop with saturated pops of blue hues on the wall tile is both vibrant and soothing. What we love most about this combo is the way it reinvents the modern beach house. Gone are the days of coral, kitschy fishnets and flip flop décor — whether or not you are an oceanside dweller, this modern palette is truly a new classic. 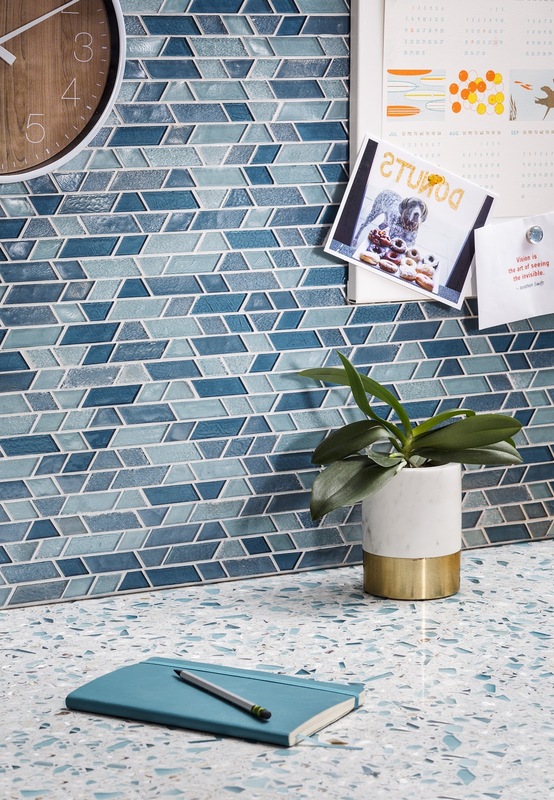 The clean lines of Oceanside Glass & Tile’s parallel pattern tile from the Muse Collection is a natural match for our Bretagne Blue recycled glass countertop. There’s a rainbow palette of products in the portfolios of Oceanside Glass & Tile and Vetrazzo, both makers include a wave of ocean hues. Maybe that’s because they share the same West Coast birthplace. Both companies were founded in California in the 1990s with a focus on making beautiful handmade surfaces out of discarded glass. The beachy feel is part of our brands’ DNA. Joining Umansky and Moser for the collaboration will be designer Kate Riley of Centsational Style and members of water shaping group Tributary Revelations, giving us recycled glass inspirations for kitchens, baths and poolside retreats. 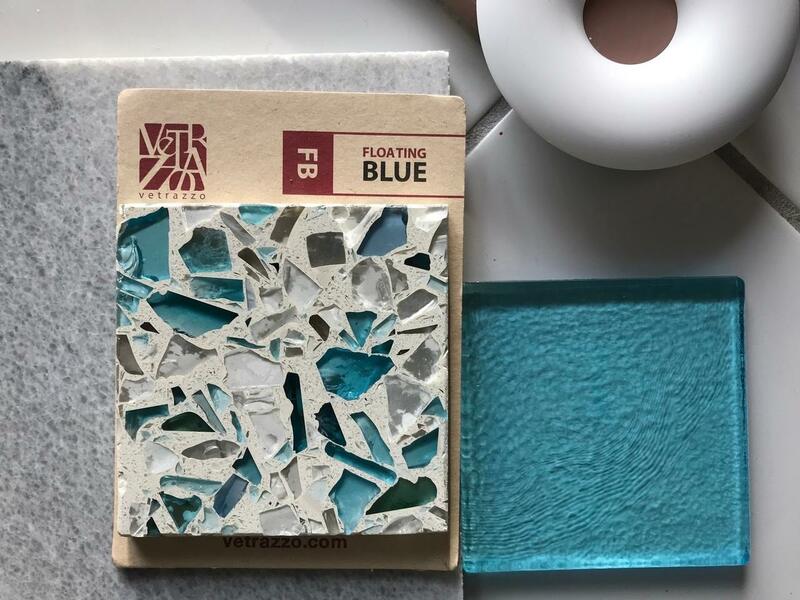 So, get ready for fresh inspiration from some of our favorite designers and creatives on how to bring the Oceanside palette into your home with recycled glass countertops, slabs and tiles from this dream team in our Coastal Cool Collaboration. If you love aqua, you’re going to love our Endless Summer Lookbook. Download it here.